NIA CHARLESTOWN NEVIS (NOVEMBER 11, 2013) – Premier of Nevis Hon. 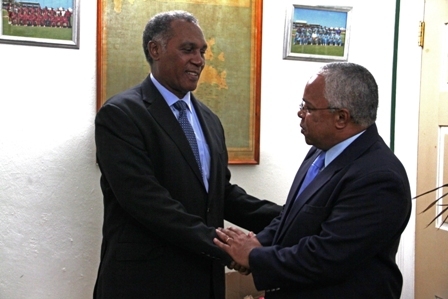 Vance Amory, welcomed Cuban Ambassador His Excellency Hugo Ruiz Cabrera, to his Office at Bath Plain on November 7, 2013, where new ways of strengthening ties with Cuba and Nevis were discussed. Speaking with the Department of Information, Mr. Amory explained that the Ambassador of Cuba visited the island to discuss areas of cooperation which existed between St. Kitts and Nevis, primarily Nevis and to re-establish the commitment to assist in areas of cooperation which existed over the years. Premier of Nevis explained a few of the areas discussed during his meeting with the Cuban Ambassador. “Some of those areas relate to education, training, medicine, heath services and our people in Nevis have benefited from those areas and I have expressed my deep appreciation to Ambassador Ruiz Cabrera and I have also asked that these programmes be continued because I think we will always need to have our people trained in many areas and some of the areas have been in health,” he said. Mr. Amory stated that although Nevis had benefited from a several areas of training in Cuba, the Nevis Island Administration (NIA) was seeking to further strengthen its agricultural production. “We’ve had training in agriculture, we’ve had training in sports management and so many others but clearly, it is important that as a Nevis Administration that we maintain that contact…I spoke with His Excellency about providing for us in training and support in agriculture development because I think we need to increase our agricultural output. “I think His Excellency has indicated that the possibility exists that we could have technical assistance and have some training so that we can bring our lands under production and can also produce more of the food we eat here in Nevis, so that we can have our people eating healthier,” he said. In response, His Excellency Mr. Hugo Ruiz Cabrera expressed his country’s commitment to contributing to the development of Nevis through previous and newly build ties. “I reiterate my commitment and my Cuban Government’s commitment to enhance the ties and the cooperation in the traditional fields in which we have been involved and even in new ones,” he said.